This is a 2,000 ft2 Doctor’s Office served by an air to air split system heat pump. A.L.M. Consulting Engineers engineered the mechanical and plumbing systems for this project. This is a 2,500 ft2 Dental Office served by several air to air heat pumps. A.L.M. Consulting Engineers engineered the mechanical systems for this project. These offices total approximately 5,400 ft2 and are located in the Village Hillcrest Rehabilitation Hospital. A.L.M. 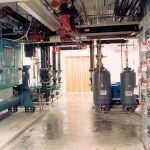 Consulting Engineers engineered the mechanical and plumbing systems for this project. The offices are heated and cooled with water source heat pumps.